The world-famous Vienna Choir Boys, founded by Hapsburg Emperor Maximilian I in 1498, celebrates its 500th birthday this year. The Choir is also celebrating its artistic rebirth under its new Artistic Director Agnes Grossman. La Scena Musicale talked to Maestra Grossman in Montreal the day before the Choir kicked off its 43-city North American tour. Grossman is familiar to Canadians as the former director of both the Toronto Chamber Players and Montreal’s Orchestre Métropolitain. 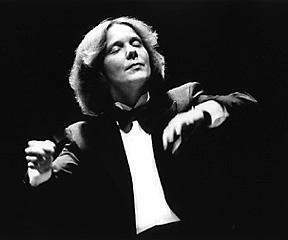 She also taught at the University of Ottawa and Montreal’s Music Conservatory in the early 80s. Over coffee and croissants, Grossman outlined the challenges she faces as the first woman director of the all-male Vienna Boys' Choir. "Times have changed," declares Grossman, projecting an echt-Austrian blend of charm and purposefulness, "and the Vienna Boys' Choir must change too." To judge from her conservatively tailored brown wool suit with horn buttons and rolled-up sleeves, Grossman’s administrative style is firm, frugal and friendly. She seems just the person to coax the tradition-bound choir into the twenty-first century. Grossman, a self-described "builder", is accustomed to challenges. Her move from Montreal to Vienna two years ago was a promotion from the frying pan to the fire. During her six-year tenure in Montreal, she built the Orchestre Métropolitain into the city’s second major ensemble, but her progressive ideas offended Board Chairman Pierre Péladeau, the brash Quebec tabloid publisher who expected his orchestra to play Beethoven, Beethoven and more Beethoven. So Grossman wasn't surprised when she was asked to revitalize the Vienna Boys’ Choir, which was felt (even by its all-male board of former choir members) to be outdated and in desperate need of modernization and change. Everyone agrees the Vienna Boys Choir had gone downhill since the early 1970s. "The singing quality was not what it should have been," admits Grossman diplomatically. "I heard a few concerts and I knew immediately what was wrong," she recalls. In fact, the Choir had become a tourist trap. The Choir School’s musical education was inadequate. The curriculum was antiquated and disorganized. Discipline was harsh. The boys were underfunded, overworked and poorly trained. The Choir’s recording contracts had lapsed, and Vienna State Opera boss Ioan Holender threatened to cease using their boys in his productions of Tosca, Carmen, La Bohème and The Magic Flute. To make Grossman’s task more difficult, she arrived in Vienna at the height of the so-called Frauenfrage (Women Question) controversy. The Vienna Philharmonic, one of the last all-male orchestras in the world, notoriously refused to accept women into its ranks until forced to do so by the Austrian government. "I was not directly involved, but, as you can imagine, I never thought the capacity for musical expression was limited to men." Grossman was not going to Vienna in order to have her initiatives shelved and forgotten, as had happened to previous artistic directors. To ensure that her new policies would be law, Grossman had it written into her contract. Fortunately, the board was inclined to trust Agnes Grossman because her father Ferdinand had been the Vienna Choir Boys’ respected artistic director until his death in 1970. "I grew up near the Choir. I remembered the Choir’s ideal sound, and my father’s objectives for it. In several ways, I am implementing his policies several decades too late." 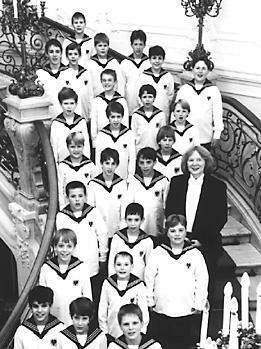 The Vienna Choir Boys is a group of over one hundred singers, ten to fourteen years old, divided into four choirs of 24 members each. Two choirs tour, while the other two remain in Vienna. The boys live in the historic Augarten Palace, where they study academic subjects in the morning and music in the afternoon, with individual voice lessons twice weekly and a two-hour communal rehearsal every day. Academic classes are small, with a maximum of eight pupils, so the boys make up for time lost during their annual three-month tours. "We only accept intellectually above-average students, otherwise they wouldn’t be able to learn fast enough," the director explains. Grossman’s changes have been deep, wide-ranging and revolutionary. The Choir’s musical curriculum was unified, to improve basic skills like sight-reading. Multidisciplinary projects will contextualize the music being performed. "Greater understanding of the social and historical context of music will lead to deeper understanding of the music and better performances," Grossman hopes. To improve the quality of life at the Choir’s boarding school, Grossman expanded leisure, sports and hobby opportunities, hired female staff and even a psychiatrist, to help the adolescent boys cope with the pressures of performing and living away from home. The former Spartan dormitories are now divided into semiprivate rooms, housing four boys each. The strict curfew has been relaxed, and corporal punishment has been suspended. Grossman approved the appointment of a separate administrative director to look after the Choir’s day-to-day business. As a result, sponsorships are on the rise and a record deal is being discussed with Sony. Traditionally, the Choir was financially self-supporting and proud of its autonomy, but with the decline in commercial sponsorships, the Choir School is forced to accept government subsidies for the first time. "I don’t know why the Choir didn’t accept subsidies sooner. Excessive touring to raise money was hurting the Choir. My long-term goal is to reduce the choir’s 400 annual appearances by 20 percent," Grossman promises. "Less work, better preparation, and a healthier living environment are essential to the future of the Vienna Boys' Choir. I want the boys to have a more normal life and to feel like individuals, not just parts of a machine. If they are happier, surely they will make better music!"